Why do a First Look? Or actually, what is a First Look? The first look is a modern tradition where the bride and groom see each other for the fist time prior to the ceremony. Typically the moment is private, with only the photographer and videographer present making sure to capture all the love. Fun Fact– The idea of not seeing each other before the ceremony came from the days of arranged marriages when weddings were more about families conducting business together. The groom wasn’t allowed to see the bride before the wedding for fear that he would back out due to a number of reasons- He didn’t find her attractive, she had bad breath, spinach in her teeth… you name it. If he said no, whatever deal was on the table, was off. So much for romance, right? 2. 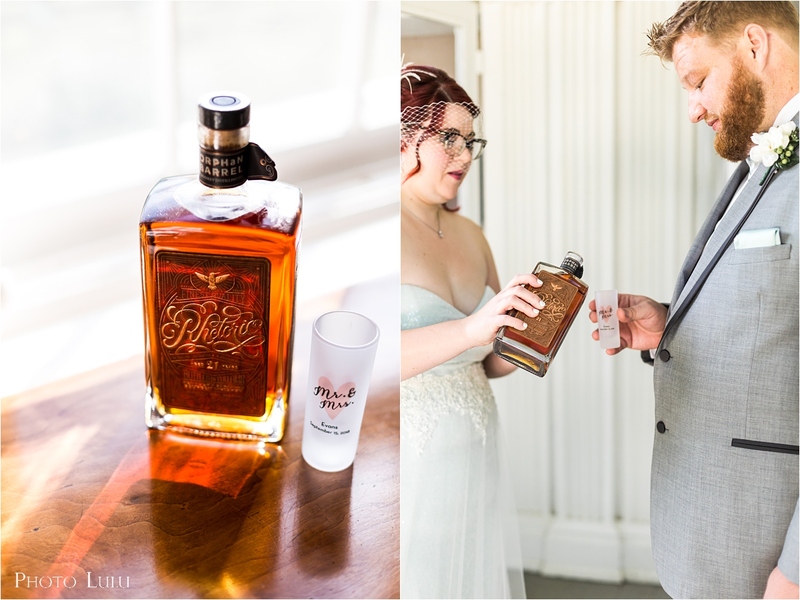 Special Moment– Imagine seeing your soon to be spouse for the first time and being able to talk to one another, cry together, hug each other, dote over each other, or maybe share a shot of bourbon and just breathe. If you meet at the alter for the first time, you’re probably not going to do any of those things because you have 100+ people watching you. Which means there is a good chance you’ll be even more nervous. 3. Get out the nerves together. The first look provides a great moment to work out the nerves together and simply pause and take in the day. Which also allows for you both to be more present during the ceremony, because you’re not as nervous. 4. More sunlight! Lighting is everything when it comes to photos. If you love the natural light look, then you’ll need the sun. Getting your portraits before the ceremony allows plenty of time for daylight. Plus, it also allows more time for the two of you to enjoy each other before you’re surround by guests. It’s YOUR WEDDING DAY, so take a moment to enjoy each other. 5 . More time with guests! By doing a first look, and proceeding with the remaining desired photos of bridal party, and family portraits, you can move right into the reception after the ceremony. You get to mingle, and EAT sooner! Trust me, after a busy day, full of emotions, you’ll be hungry. 6. No Regrets! I’ve worked with several couples documenting their wedding day, and I can honestly say that not a single couple has ever regretted doing a First Look. Yes, at first some couples have chosen to forgo the first look. However, when we sit down together a few weeks before their wedding and begin mapping out the timeline of the day, the first look begins to look more and more enticing. Couples realize just how busy the day will be, and how the first look will allow more time with the one they love the most. After all, the reason for the day is each other, right?